Casey’s new inclusive playspace set to open! The community is invited to join in the celebrations when the Deputy Mayor officially opens the highly-anticipated Livvi’s Place in Lyndhurst – the first inclusive playspace of its kind in south-east Victoria. 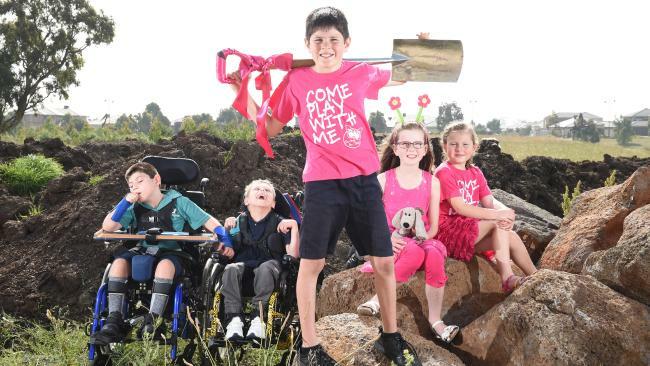 Council has worked in partnership with the Touched by Olivia (TBO) Foundation to deliver the playspace, located at the Marriott Waters Recreation Reserve, designed so that children of all ages and all abilities can play side-by-side. The project is almost complete and will be officially opened by the Deputy Mayor, Cr Louise Berkelmans, on Sunday 13 September 2015 as part of a celebration hosted by TBO. City of Casey Mayor Cr Mick Morland said Council was excited to open this playspace to the community and encouraged residents to come along to the celebrations and ceremony. “This playspace responds to the growing demand for a location in this region that allows children of all abilities to play together in a purposely designed environment. Council has worked closely with TBO to develop a space that is truly inclusive and accessible to all members of our community and we are excited that it will soon be open for everyone to enjoy. “Every detail needs to be considered for a space to be truly inclusive and the design of Livvi’s Place reflects that, with accessible pathways, passive areas, sensory and tactile play spaces, ramps to equipment, full-fencing and accessible parking. “There’s play equipment suitable for children of all abilities, including a double flying fox, slide, basket swing, climbing mound and net, interactive panels and a wheelchair carousel. As the only playspace of its kind this side of Melbourne, Council hopes this will become a destination for people across the region to meet and socialise while their children play,” Cr Morland concluded. TBO Executive Officer Bec Ho said Livvi’s Place would be a much-loved gathering place and bring lots of enjoyment to so many in the community: “We have been fortunate to have the support of Therese Howell as our volunteer community driver for the project. Therese has brought together a group of passionate and committed people who have helped to design, fund and now build Livvi’s Place. “I am delighted to see this beautiful place open and become a special space where all people can play, side by side, for many decades to come. That is true inclusion,” Ms Ho said. Livvi’s Place will be officially opened on Sunday 13 September 2015 with Council’s ceremony at 11:30 am and celebrations to run throughout the day between 11:00 am and 2:00 pm hosted by TBO. The celebrations will include a barbecue, roving performers, a sing-along with children’s entertainer Jay Laga’aia, performances from local disability groups and face painting. Livvi’s Place is located at Marriott Waters Recreation Reserve, Boland Drive, Lyndhurst. The playspace represents an investment of more than $1.1 million, with Council contributing almost $900,000, the Victorian Government contributing $49,688 towards shade sails under the Department of Health’s Shade Grants program and the rest funded by business, individual and community contributions in support of TBO.